Molex announces three Watertite FD Multiple Outlet Boxes with Closure Plugs and Reducers. The non-metallic Multiple FD Outlet Boxes are constructed of rigid PVC, making them extremely durable and resistant to impact, chemicals and solvents. Offering greater depth, they provide 30 percent more volume than traditional FD boxes, and are available in single-, two- and three-gang configurations to provide greater flexibility. NEMA 4X and IP66 ratings help ensure that the boxes retain a secure, reliable watertight seal to reduce the risk of electrical shock, nuisance tripping, and other electrical hazards, even in environments where frequent high-pressure equipment washdowns are required. 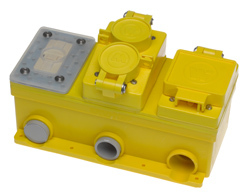 The FD boxes are designed to be used conjunction with Woodhead Watertite plugs, receptacles and GFCI coverplate modules in a wide range of wet locations and harsh industrial environments. Typical applications include food, beverage and chemical processing facilities, oil and gas refineries, water treatment plants, and outdoor construction locations and event sites. The Woodhead family of Watertite components is designed and built to perform reliably in a wide range of industrial and harsh environments. In addition to a selection of FD Non-Metallic Boxes, the Watertite portfolio also includes: GFCI coverplate modules and standard coverplates, cordsets, plugs, connectors and receptacles.